Residents of New Home, New You, a one year project by Plymouth Community Homes in partnership with One You Plymouth, are discovering new and on-budget family recipes at a healthy cooking class. 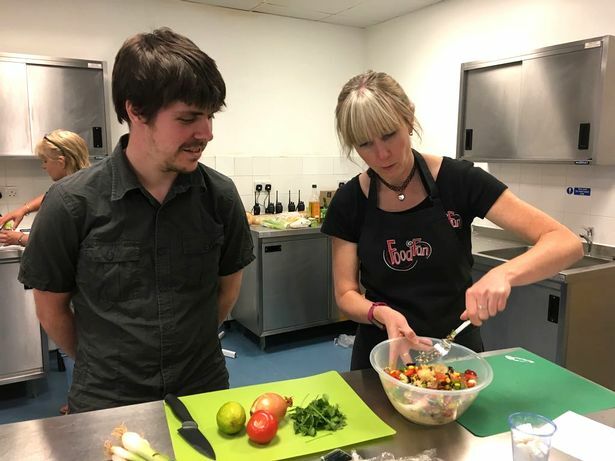 Food is Fun is teaching residents at the Beacon in Devonport and across the city, to love food and to cook healthy, colourful dishes with their children. We teach people moving into their new homes that this is a new start and they can learn some healthy recipes which they can reproduce at home which are suitable for the whole family. It’s important that all these dishes are ones that children can take part in too. It gives them the opportunity to try new produce that they may not have been open to or tasted before and also find out how to prepare them, store them and cook them and if they make a mistake it doesn’t matter – it’s all about practice. He said: “Today I’m doing two recipes with the help of Tami from Food is Fun – we’re doing pasta in a tomato sauce and a rainbow couscous. Having the veg bag means I don’t have to go out and buy the produce – it’s already there so there’s no excuse. It means my daughter eats more vegetables and if I’m feeling lazy there so there’s no excuse because it’s all already there for me. It’s an incentive to be a little healthier because you have all the essentials there without having to go out. Grow, Share, Cook is a Cities of Service project, launched in 2014, that helps those most in need to access high quality fresh fruit and vegetables. The scheme uses a volunteer model to support growing fresh produce, delivering it to families in Plymouth and providing cookery sessions to give inspiration in the kitchen. The project is supported by Cities of Service, Plymouth Community Homes, Tamar Grow Local and Food is Fun CIC. A celebration event has taken place to mark one year of volunteer cookery sessions with residents. 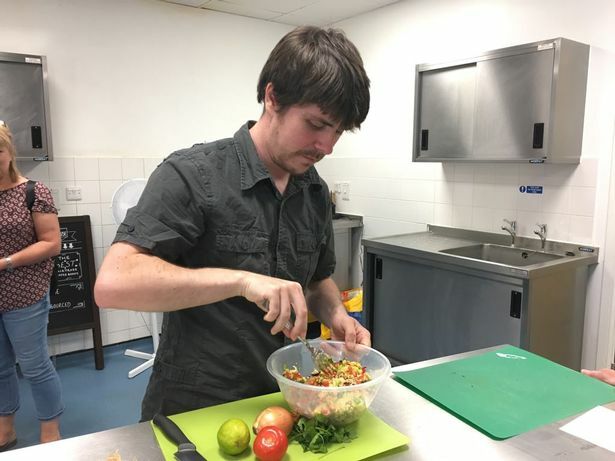 The Grow, Share Cook sessions up at Plumer House, the headquarters for Plymouth Community Homes, led by Tami Skelton from Food is Fun, have now been taking place for a year as part of the Our Plymouth volunteer initiative. The aim of Grow, Share, Cook, is to mobilise volunteers to grow more fresh fruit and vegetables, the development of community gardens and the distribution of the food to those in need, as well as healthy cookery sessions. Our Plymouth is based on the Cities of Service volunteer model and Plymouth is one of seven cities in the UK to be selected to take part. Cities of Service is based on an American volunteer scheme initiated by the former Mayor Bloomberg and has been adapted for the UK by the Cabinet Office and Nesta. Locally Our Plymouth is coordinated by Plymouth City Council working with a range of local partners. The celebration event was aimed at Grow, Share, Cook volunteers and participants and was attended by around 30 residents plus Our Plymouth volunteers and representatives from a range of local partner agencies. There were people of all ages at the event, from pre-school to pensioners, the youngest of which was three year old Lilly-Ruth Robertshaw. Darin Halifax, Chief Cities of Service Officer for Plymouth City Council, said: “We are really pleased with the success of Grow, Share, Cook and the difference it has made to people’s lives so far. The project has worked really well with the help of our partners Food Is Fun, Plymouth Community Homes, Tamar Grow Local, Plymouth City Council and most important of all, the volunteers and participants – we couldn’t have done it without them all. Key partners in Grow, Share Cook are Tamar Grow Local, Food is Fun and Plymouth Community Homes. There are a range of volunteering opportunities available and among those is delivering fresh fruit and vegetables to people’s homes. Since the initiative was launched, 22,500 portions of healthy food have been distributed. In addition to Grow, Share, Cook, other schemes under the Our Plymouth banner include Energy Champions which promotes energy efficiency across the city, and Right to Read, which encourages local people to volunteer their time to help schoolchildren read. Our Plymouth partners also include Plymouth Energy Community and Plymouth University. Since Our Plymouth was launched, 22,500 portions of healthy food have been distributed through Grow, Share, Cook, Plymouth residents have saved £134,000 on their energy bills, and 117 volunteers have been recruited to the project. In addition, almost 2,000 residents have had conversations with our Energy Champion volunteers.